Park City-based visual artist Greg Ragland is a popular man. 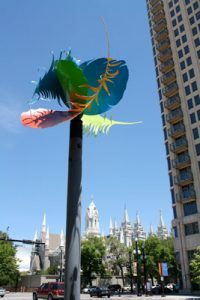 Not only does the painter and sculptor show his works at J GO Gallery and other galleries in California, Georgia and Colorado, but he has new pieces that have been installed and will be installed in downtown Salt Lake City. He is also the poster artist for Plan-B Theatre Company, which is currently presenting “Hedwig and the Angry Inch” at the Egyptian Theatre through Sunday, June 17. Regardless of what media he uses, Ragland always starts off a project with a drawing. “That gives me a vision of what I want the project to look like,” he said. “But if it’s a sculpture, once it’s scaled up, it becomes a whole new different ballgame, because everything scales up differently.” Throughout the years, Ragland has developed a method that has helped him keep things in perspective. “I usually try to plan enough time on the project so I can meditate on things before I go to sleep,” he said. “After a week or so, especially with big pieces, I know what I want and the idea and imagery appears to me while I sleep. When I wake up, I have a clear vision for solving each of the individual problems of the sculpture.” Ragland’s sculptures are made of cast resin, bronze and mixed media. Greg Ragland’s art can be seen during Plan B Theatre’s production of “Hedwig and the Angry Inch” that runs June 14, 15 and 16, 8 p.m. and June 17, 6 p.m., at the Egyptian Theatre, 328 Main St. Tickets range from $20 to $30. For more information and tickets, visit www.parkcityshows.com.